The Honey Bear is getting his first Upgrade since 1999! Stay Tuned for the new release! He's gonna be badass! The one and only Honey Bear pipe from one of our favorite movies of all time, True Romance. 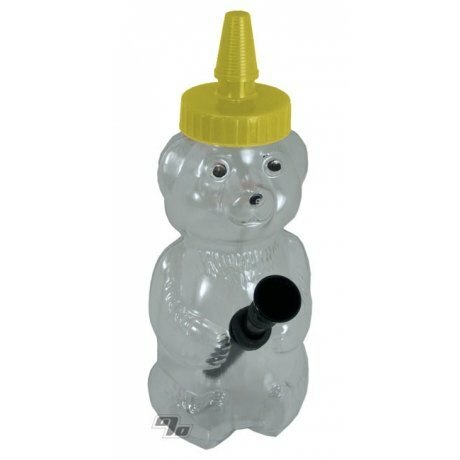 Use the Honey Bear Pipe with or without the top. You can reference Brad Pitt's performance for instruction. Looking for the perfect gift which says you care while easy on the wallet? Then it has to be the Honey Bear. Dressed here in classic Bumble Bee black and yellow. Great to pass with friends. It's definitely fun and cute. You have to clean it frequently to use it for awhile since it's plastic. I love it now but when I first got it it had an air leak around the downstem grommet. It was an easy fix and it didn't cost much so no big deal. Bought one for myself and one for a friend and we both love our honey bears. Great for personal use and fun to show off. Hits well, cleans up easy. Not sure how long it will hold up, but for the price you really can't beat it. For being such a cheap pipe this little guy works great. I fill him up with some ice cold water and get super smooth hits. I'm on my second one. The first got so gummed up and packed with resin it was useless trying to clean. Now I've been shaking cleaner the through it once a week or so and it's staying like brand new. I'd highly recommend it, even just as a cool piece to talk about, my friends love it!